and here's another other alphabet. and compound the crisis. Deepen it. It uses us. It might as well. But agency is ours to tell. 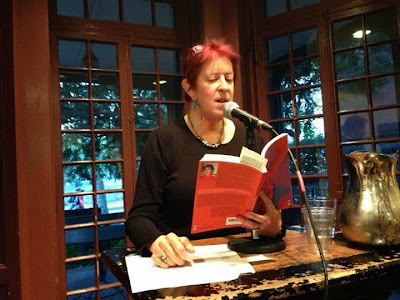 Rachel Blau DuPlessis [photo of the author reading at Kelly Writers House in Sept. 2013, taken by Al Filreis] is the author of the long poem Drafts. Her newest book is Surge: Drafts 96-114 (2013) from Salt <saltpublishing.com>. The first of several "interstitial" works, Interstices is due from Subpress in 2014. Also in 2013, translations of Drafts into Italian and French were published: Dieci Bozze (trans. Morresi) from Vydia editore and Brouillons (twenty works trans. Auxeméry) from José Corti. She is also the author of the feminist critical trilogy, The Pink Guitar, Blue Studios, and Purple Passages.